I should preface this review by saying that though I read comics and graphic novels, I've never been into manga. 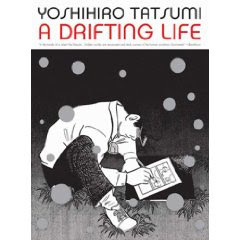 I'm not an authority on the style and I'd honestly never heard of Yoshihiro Tatsumi before I read A Drifting Life, his manga-as-memoir. I picked it up because it sounded kind of interesting and received a rave review from a comic critic I've come to respect. Tatsumi (or Katsumi, as he calls himself in the book) starts his story shortly after World War II, as he and his sickly brother become obsessed with the manga of the time and start drawing it themselves. He's published before he's even a teenager and rises quickly through the ranks of manga artists. We see him grow older and experiment with new types of manga, creating a new genre. We also see him struggle with new publishers, new cities, and various personal issues. Make no mistake, this one's a talkie. That makes things a little awkward, since this was obviously written in Japanese. The dialogue can be a bit stilted at times, but have you ever seen or read a natural sounding English translation of something that was originally in Japanese? I've always wondered if that's really the way the Japanese talk, or if it's just inevitably how the English translations turn out. Everything is stated so matter-of-factly that it can be slightly jarring at times. And as someone who's much more used to detailed (and often colored) American comics, the Japanese style can seem a bit bare bones at times. Then again, it reportedly took Tatsumi 10 years to write and draw this 800+ page epic, so I was able to quickly get past the simplicity of some of the illustrations. I felt I learned a lot about post-war Japan, a subject I knew virtually nothing about. Tatsumi takes great care in describing the state of the country every few years during the narrative, commenting on the culture, politics, and major events that were shaping Japan. It does a good job getting us inside the head of an artist who is passionate about his medium. His desire to create, and not just to create, but to invent something new within the realm of manga, comes through clearly. Here's a man who learned to make a living doing something he loved. Yeah, it sucked at times, but it's still an encouraging story. It seems like a pretty honest autobiography. Tatsumi takes credit for some major innovations in manga, but he doesn't shy away from his own failings as an artist or as a person. Though I'm sure the logistics of producing and publishing manga is different in many ways from the types of comics I usually read, I still feel I learned a lot about a medium that I've come to enjoy more and more. There are also plenty of reasons the book may not be for everyone. Tatsumi gets into some pretty nitty-gritty details about publishing at times, or even details about seemingly random every day events. Why does he spend two pages showing to people eating noodles together? I actually thought the depictions of "normal" Japanese behavior were kind of cool, but I could see them becoming tiresome for the casual reader. I also found myself having the same issue with this book as I often do with Russian literature: I lost track of names. I confess it's a lame weakness on my part, but after dozens of Japanese names were thrown at me, I started losing track of who was who after a while. Ultimately, I would never reccomend this book to anyone who's not into comics or graphic novels already. You definitely don't have to be into manga to enjoy it (though you might enjoy it even more than I did if you are), but coming into this with an appreciation for the graphic medium is a requirement I think. If you haven't picked up a comic of any kind for 20 years, this is not the place to start. But for those of us who like their stories in panel form, A Drifting Life is a satisfying and illuminating read.